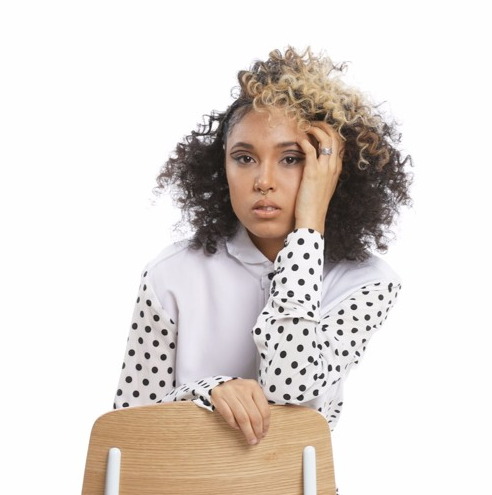 To tell people that they are not alone in their battle, Brooklyn-based singer/song-writer Tangina Stone shares her experience with being on suicide watch and her struggle with anxiety in her WOLFGVNG-produced track “Anxious”. A few weeks ago, the subject of mental illness was addressed here at Highclouds when we were wondering about artists that were being more open about their struggles. As a journey of self-care, accepting your flaws and embrace pain to learn from it, “Elevate”, her somophore album, will be the rollercoaster of her emotional life. With the fusion of R&B and electronic sounds that we know already from her debut “The Fall”, Tangina Stone gets closer to her audience, shares her very personal experiences and decides to dig deep into her wounded soul to heal. We decided to sit with her as we were curious about “Elevate”, the message she wants to address to her fans, specially those of the LGBT community, as an out artist herself. Highclouds: What can you tell us about your new track “Anxious”? “Anxious” is a very important and personal song for me. It is about my own personal struggle with mental health. I think it is important to start more conversations that revolve around mental health. Why did you decide to address such a personal issue such as mental health and suicide? I decided to address these things because I just don’t feel like they are addressed often enough. Sometimes mental health and suicide are not talked about until it is too late. Until a person has already decided to take their own life. This has to change. If I have to be brave, vulnerable, and open about my own experiences to start these important conversations, and spark important work that revolves around mental health awareness and suicide prevention, then so be it. In which way do you think this work is different from what you have done in the past? This work is different because I am baring all in it. I feel like after listening to this album, a listener will know me in ways that currently, only close friends know me. I feel like listeners will really get a sense of what I am made of. Why do you think there are so many LGBT people struggling with mental health? I think that there are stigmas attached to mental health awareness. People are often told that their struggles with mental health are not valid. They are told they are just being dramatic. They are shamed for talking about what they are feeling. It is not uncommon that a person who is a part of the LGBTQ community feels alone, is disowned or shunned by family members after coming out. I think the lack of support and love can easily lead to struggles with mental health. Do you think people are ready to hear from artists about their struggles? I feel like many are. I make music for those who are. Those who are not ready need to go get ready. What can we expect from you in your new album “Elevate”? You can expect honesty. You can expect vulnerability. You can expect fun. Politics. Anger. Frustration. Sadness. Happiness. You can expect all of the things that make me, me. What message do you have for people struggling with mental issues out there? You’re not facing this struggle alone. Mental illness often tells you that you are alone. It tells you that you are worthless and unloved. The truth is that none of this is true. You are worth fighting for. You are worth loving. You are beautiful. And we will unpack and address these issues together. You can follow Tangina Stone over Facebook, Twitter and Soundcloud.